Fish, being creatures of habit, usually return to the same hole. Anglers, being creatures of habit, do too. Yet the Adirondacks has in the neighborhood of thirty thousand miles of rivers and streams, and three thousand ponds and lakes, so men and women who like to fish hardly have an excuse for not exploring some new waters every now and again. But where to start? Simply listing all the waters in the Adirondacks and environs would be a daunting task, but parsing the vagaries of each individual fishery is a job sure to wear a lot of rubber off the soles of your waders. Yet Spider Rybaak gives it an admirable shot in Fishing the Adirondacks: A Complete Angler’s Guide to the Adirondack Park and Northern New York (Burford Books, 2016). Authors of fishing guidebooks are in a no-win situation. If they are too vague about fishing spots, they will be harumphed by seasoned fishermen for lack of insight, but if they are too specific they will be hissed for giving away all the locals’ best-kept secrets. At 250 pages, Fishing the Adirondacks is not detailed enough to be giving away anyone’s closely guarded fishing holes, nor can it practically cover all the ponds and streams out there. It is better thought of as a survey course for fishermen of all experience levels who are looking to try some new waters. In this manner it succeeds quite well, as Rybaak provides basic but relatively complete information for roughly two hundred bodies of water in northern New York. It’s a reasonable approach, especially on larger bodies of water such as Lake Champlain, which are deserving of entire books on their own. There, for example, Rybaak focuses on the boat launches, with a line or two about what weed beds or reefs might be in the area. Thankfully for the more modest angler, he does not presume that the average fisherman is in possession of a maze of downriggers or a two-hundred-horse bass boat. So while he includes, say, the Point au Roche boat launch, he also notes that good fishing for northern pike and walleye can be found down the road at Point au Roche State Park by hiking out to the cliffs on the east side of Long Point. Fishing the Adirondacks covers three regions: the Adirondack Park, the Tug Hill Plateau, and the Thousand Islands, although true to its name, the book primarily focuses on the Park. For each fishery, Rybaak gives a (sometimes very) brief description of the waters and identifies the species of fish that reside within. He goes on to specify which baits work best at which times of year and in which locations. If the waters are good for ice fishing, he notes that as well. The book is also a helpful resource for the types and numbers of fish that are stocked each year by the state Department of Environmental Conservation. Especially for amateurs, this can be affirming in the sense that it helps to know there are fish out there, somewhere. Conversely, Rybaak also helpfully notes when not to bother if, for example, the trout have retreated to colder pastures for the season. Rybaak includes a number of interesting environmental tidbits throughout the book. At Chazy Lake, he writes, a local decision to fight aquatic-plant growth by lowering water levels in the fall wreaked havoc on the once-vibrant lake trout and landlocked Atlantic salmon populations. And he catalogs the damage done by acid rain, such as decimating the population of brookies in Cranberry Lake. Sometimes, nature itself doesn’t like to be told what to do: Rybaak says the locals near Third Lake in the Fulton Chain believe that the state’s annual stockings of rainbow trout never size up because they immediately become food for hungry muskies and northerns. 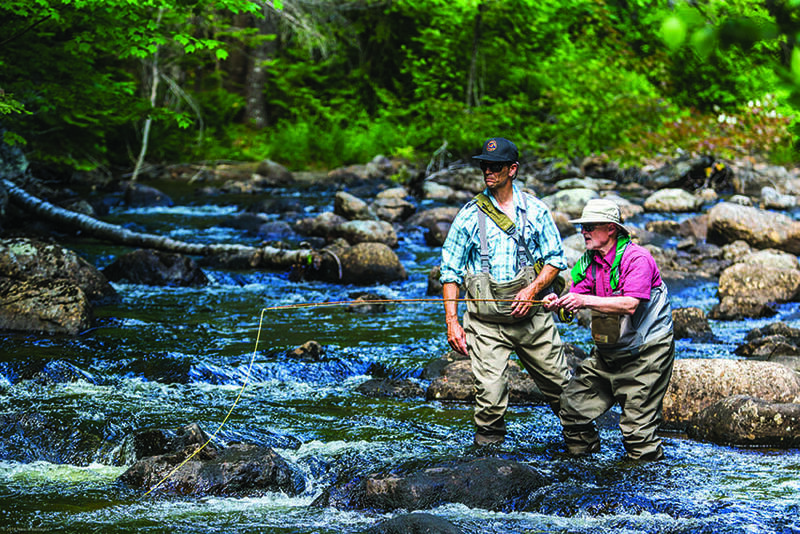 The Adirondack Park has thousands of miles of fishing streams. Rybaak is generally apolitical about the presence of Big Brother as it pertains to rods and reels, but sometimes he can’t help himself, with amusing result. On the lower Boquet River, Rybaak simply punts, telling readers that the waters are governed by “a mess of regulations” and advising in the name of brevity that they are probably better off just reading the DEC manual for themselves. As such, Rybaak’s writing style is delightful, despite being hemmed in a bit by the constrictions of guidebook-speak. Even in such a templated format, his wit shines through—he mentions that the state record holder for brown trout is Tony Brown, “no relation”—and makes you wish for a more narrative form, or even better, for the opportunities to sit and listen to his fish stories around a campfire. He also drops in little historical nuggets that will interest newcomers, such as the fact that Tupper Lake was named after a surveyor (Ansel Tupper) who drowned in it while fishing. Among the other curiosities is that Hurricane Irene, which so devastated the East Branch of the Ausable River valley, actually did the fishery some good, by blasting out silt and digging new holes. 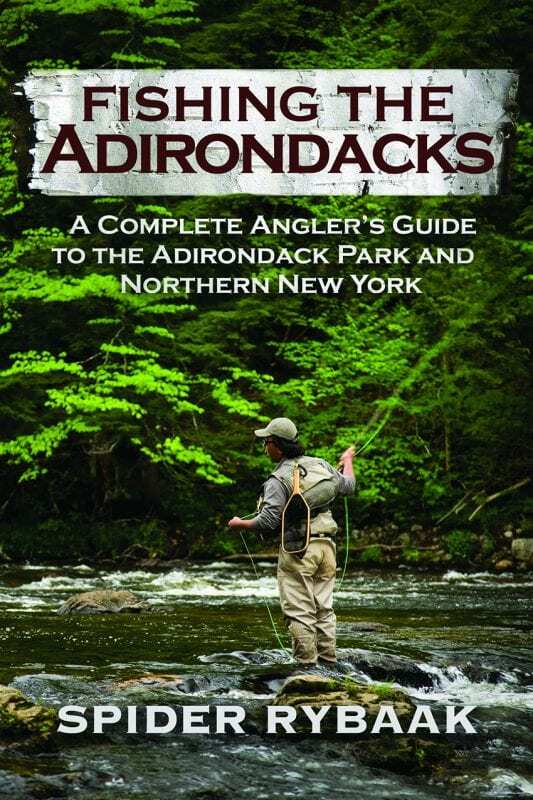 So while it might not let you in on any great fishing secrets, Fishing the Adirondacks is an excellent idea book to thumb through in search of a new place to get a line wet. Rybaak will get you there, tell you what to fish for, and what baits are likely to work best. The rest is up to you.